It is no secret that I despise driving in Richmond. Usually it conjures up feelings of fear, anxiety and anger. Fear of the driver who doesn't shoulder-check, anxiety emanating from the potential of being cut off and anger from having your parking spot stolen by not one; but 2 other drivers. As much as people give me a hard time about it, it is true. Either I have very bad luck or the people giving me a hard time are those drivers. But all this has never stopped me from traveling into the land of full-visor drivers and courtesy cars. The food is too enticing. So much choice and generally inexpensive, I dare to suffer the consequences of my choices. So imagine to my surprise when Tourism Richmond invited me to participate in one of their monthly media dine around events. 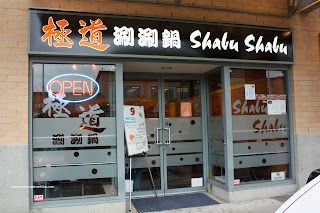 Interestingly, the plan was to meet up at the Lansdowne skytrain station where we would be driven to our eating destinations in a Mercedes limovan. Oh... I see. Eliminate the driving and parking. Then there is no way I could whine and complain. I understand their angle. Well, the theme of this particular dine around event was beef. Wait a moment. I get to be driven around in Richmond in a limovan not worrying about parking and get to eat lots of beef? Richmond is suddenly looking better and better. Great, from this point on, I am ruined. I may need to hire a taxi to take me around Richmond. 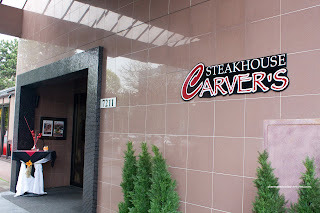 Our first top on the meat tour was Carver's Steakhouse located in the Executive Inn. We started with the Truffled Carpaccio of Beef consisting of Angus beef tenderloin dressed with a sherry vinegar emulsion, truffle oil and finished with freshly grated Bolivian rose salt. The beef was buttery soft with a pronounced truffle aroma. I found that the vinegar emulsion announced itself without interfering with the truffle oil. Honestly, I didn't really noticed the Bolivian rose salt; but it was neat and apparently it is healthier. Served on the side was an Asparagus & Arugula Salad with sun dried tomatoes, lemon herb vinaigrette, toasted almonds and shaved Parmesan. 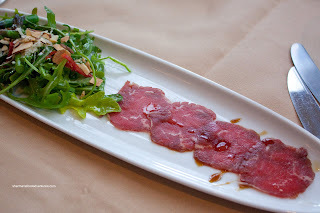 The salad was a nice compliment to the carpaccio. I thought the sun dried tomatoes would be overwhelming; but in the end, it just blended in. I probably would've liked a bit more dressing though. For our "main", we got a Steak Sampler featuring one piece each of Rib Eye, Certified Angus New York and Filet Mignon with grana padano gratin potato, seasonal veggies and veal port wine reduction. All the steaks were prepared perfectly medium-rare. The quality of the Angus beef was quite evident; but I thought the veal port wine reduction the one thing that made everything sing. It was silky, rich and really helped accent the delicious meat. Lastly, we were presented with a Passion Fruit and Concord Grape Sorbet as a palate cleanser for our next food stop. This was a bit weak in my opinion. 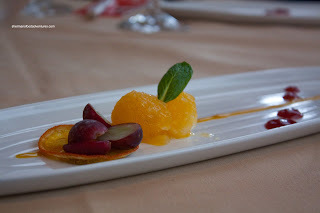 It was presented beautifully; but the sorbet was in "flakes" and too sweet. Off to our next restaurant, which was Gokudo Shabu Shabu. 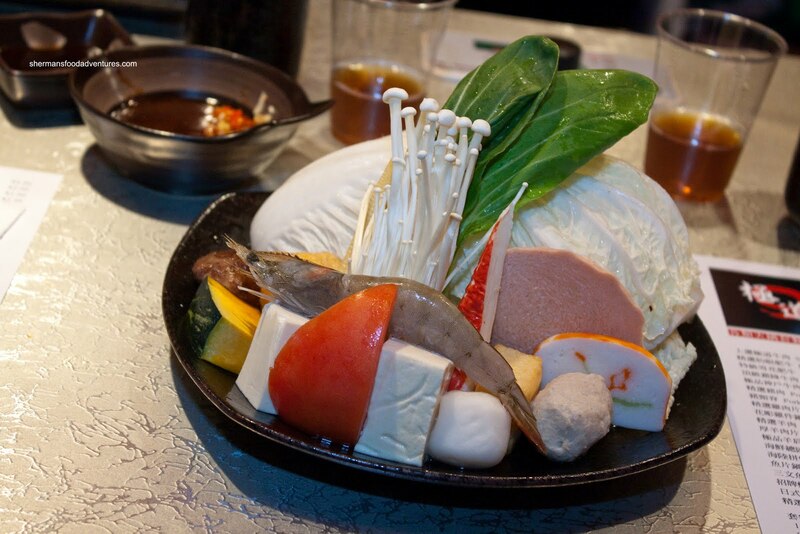 This is based on the Japanese version of hot pot with a Taiwanese twist. Say what you want about authenticity. It doesn't really matter all that much if the food is good. Unlike many of the usual hot pot joints in town, this one features a personal hot pot for each individual patron. 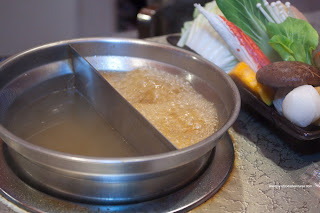 We were presented with a split hot pot consisting of chicken broth and spicy broth. We tried each one before cooking any of the ingredients. The chicken broth was actually quite flavourful and sweet while the spicy broth (which is based on the same chicken broth) definitely had a kick. Since they knew we were eating 3 complete meals, our Sirloin/Kobe Combo was scaled back. They did provide a full version for reference and the corresponding picture is exactly that. It consists of Napa cabbage, Shanghai Bak Choy, enoki mushroom, shiitake mushroom, tofu, squash, tomato, fish tofu, shrimp, cuttlefish ball, pork meatball, imitation crab, vegetarian ham and fish cake. Served on a separate plate was the beef. Normally, it would be either all sirloin or all Kobe; but for sampling purposes, we got a mix of both. Naturally, the fattier beef on the plate was the Kobe. 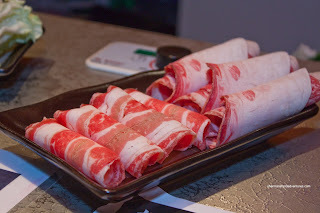 As I've said many times, hot pot is not rocket science. The freshness of the ingredients are paramount as to whether it will be a good or bad hot pot experience. And of course, the soup base matters as well. In this case, there is not much to complain about since everything was as expected. Well, the beef was a bit better than expected being evenly marbled and tasty (from all the fat!). Our last stop was Tramonto in the River Rock Resort. I gotta admit that there was a bit of trepidation on my part. The place hasn't exactly received a ringing endorsement from the many online reviews out there. Of course this would not be exactly a typical visit since we were on a media event. But once again, I need to say that a restaurant cannot over or underachieve significantly despite knowing ahead of time if they were going to be written up. It's like asking a golfer to score 10 shots better than their personal best on request. Ain't gonna happen. So with that out of the way, we were given a sneak peak at their new menu. We started with the Rabbit Consomme with braised leg meat, spinach & ricotta ravioli, tomato confit, picholine olives and roasted fennel. This was a very delicate offering. 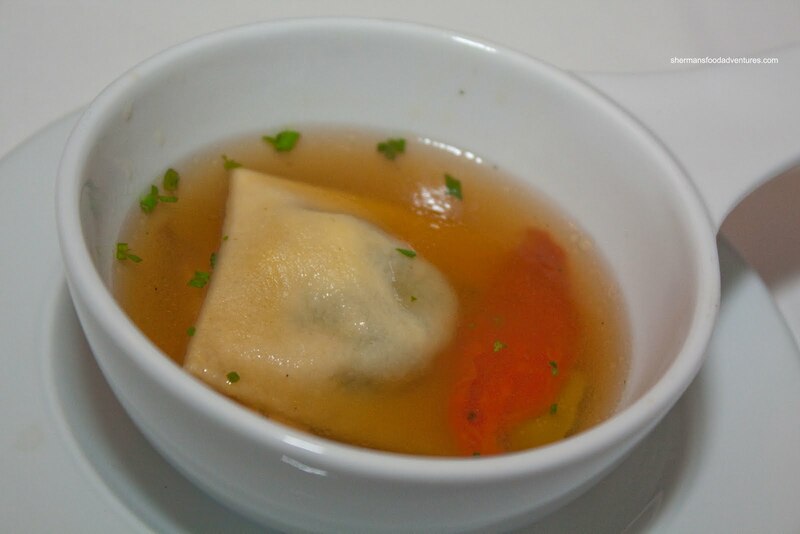 From the fragrant; yet light broth to the perfectly cooked pasta, this was a good if not unremarkable starter. I did like the punch of the olives though, it gave a nice salty kick. Next was the Qualicum Beach Scallops with avocado salad, burgundy truffle and tomato chutney. This was a pretty straightforward dish with perfectly seared scallops. These one-bite morsels were topped with edible gold (which looks nice; but we really can't digest it). 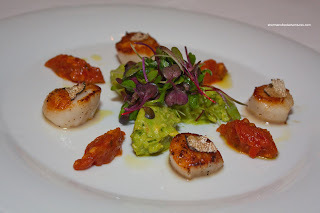 I liked how the accompanying items on the plate were not at all overpowering, which allowed the scallops to be the star. I particularly liked the tomato chutney because it offered up some acidity while still being mild at the same time. Without even discussing the following dishes, the Peking Duck Leg Confit was my favourite item hands down. 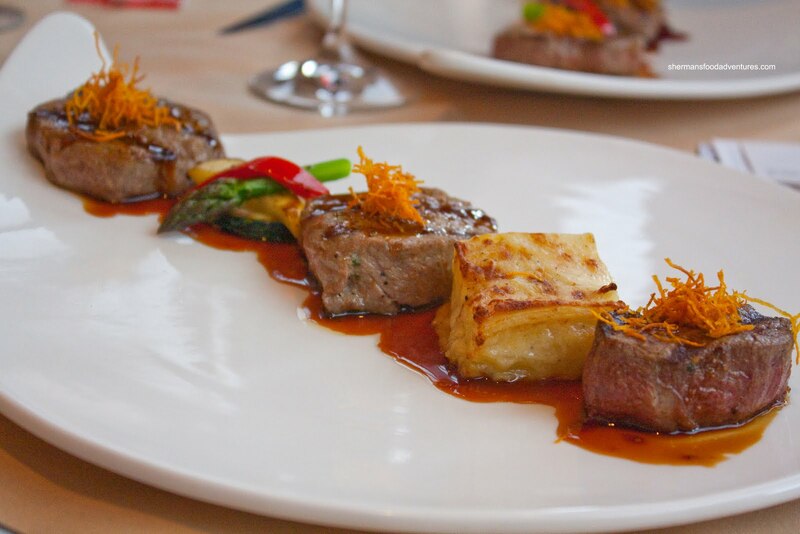 It was served with a really large pan-seared piece of foie gras, pand'epices, caramelized pear and apple reduction. The duck skin was rendered so that there was very little fat. That resulted in it being very edible and decadent. Lying beneath was some of the most moist, melt-in-your-mouth confit meat I've ever had. I barely needed to chew it. Furthermore, it was not aggressively salted, which allowed the natural duck flavour to come out. Although I really enjoyed the big piece of foie, I would've liked to see it seared a touch more. 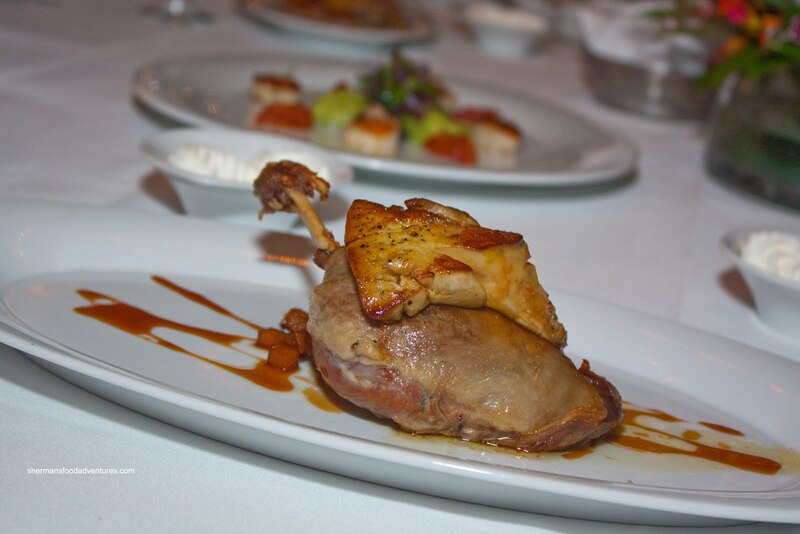 The pear and apple reduction was a natural compliment to the rich foie providing a full-bodied sweetness. Outstanding execution on this dish. Finally, we got to the the "entrees" starting with the Braised Osso Bucco with risotto alla Milanese, Cipolinni onion and germolata. The slow-cooked veal was fork-tender and extremely moist. Lots of rich flavours at work as well. Despite the this, I would've preferred a tad more salt. This would've really made the flavours sing. 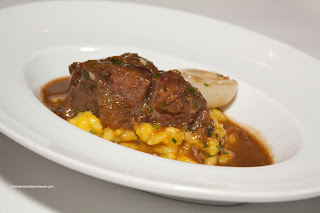 As for the risotto, it was very creamy and rich. I could definitely taste the fat content from multiple sources in it. The rice was still firm; yet cooked all the way through. Finally, we got to the featured item of the night being the Wagyu Beef. 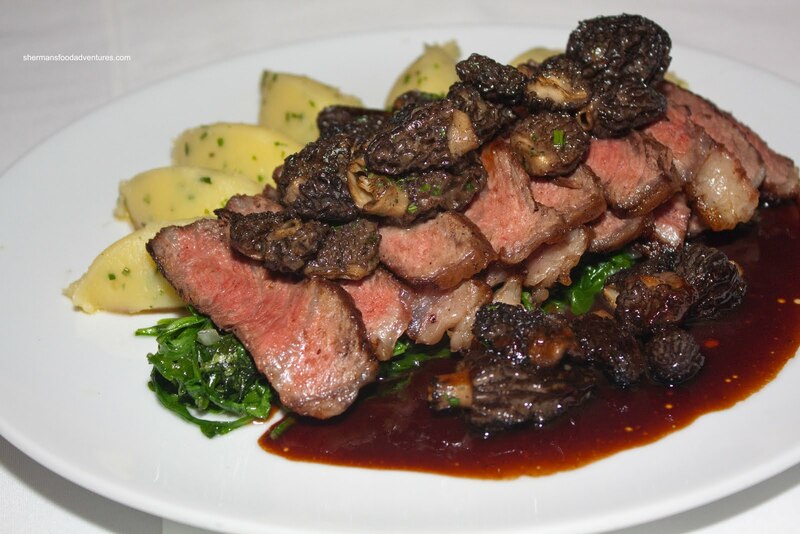 It was served on a bed of wilted spinach, chive potato quenelles on the side with a bevy of morels on top finished with a beautiful demi-glace. First off, Wagyu is not your typical beef where you can cooked it rare. The high fat content requires the cooking process to "melt" it so that it isn't chewy. As evidenced in the picture and in my devouring of the meat, it was cooked absolutely perfectly. The morels were a wonderful addition to the plate while the rich, silky port reduction provided just enough accent to the meat. As if we needed anymore food at this point, we were served 3 desserts to share starting with the Grand Marnier Creme Brulee. I found the custard to be silky and of a good consistency. There was a definite Grand Marnier hit which did not overwhelm. 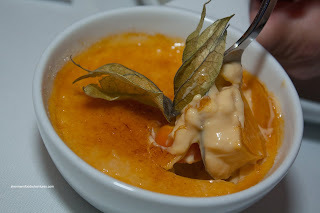 The custard itself wasn't too sweet which was a good thing since the torched sugar topping is very sweet. 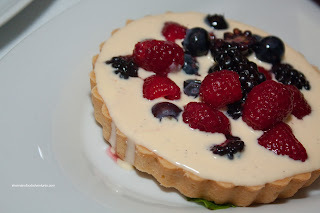 Probably the best tasting dessert had to be the Marscapone and Berry Tart. The marscapone filling was only semi-sweet; but ultimately delicious. The fresh berries didn't hurt either. The tart shell itself was firm while not being dense. However, the one thing that bugged me was the consistency of the filling. It was far too thin and leaked all over the plate when "forked". If they can thicken it up a tad, this would be perfect. Mercifully while still enjoyably, our last dessert was the White Chocolate Cheesecake with caramelized pineapple. The cheesecake itself was light and fluffy rather than the New York-type. It was not too sweet and had a hint of cream cheese flavour. I really liked that they did not use a traditional graham crumb crust. Instead, it was appeared to be a layer of flourless chocolate cake. Now, the cheesecake was pretty plain until I ate it with the pineapple. 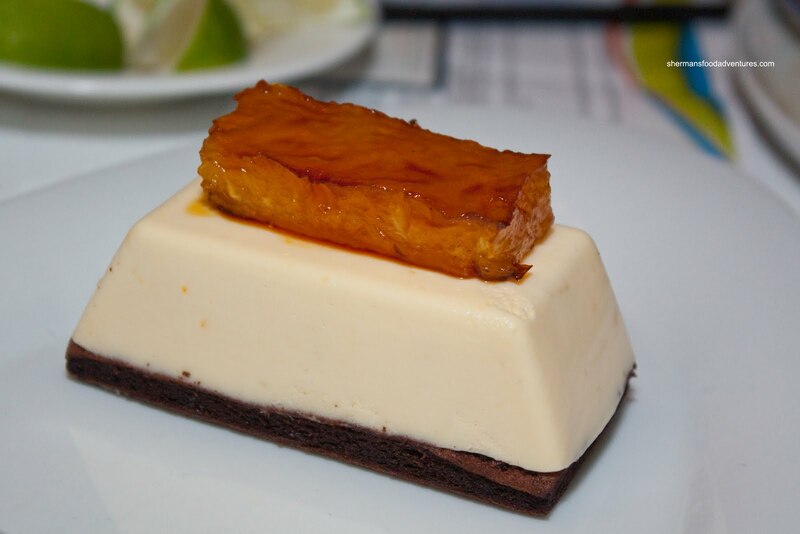 The intense sweetness and a touch of acidity added the missing components which made this cheesecake good. By this time, I was getting the meat sweats much like Joey on Friend's after his attempt to tackle a whole turkey. They had originally suggested we pace ourselves and even pack some of the leftovers in the provided Tupperware. However, me being me, I ate everything. Yes, I ate all the food that you see here. I didn't have any leftovers. 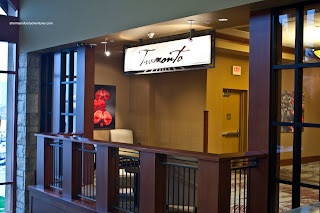 This was a wonderful introduction to 3 restaurants that I've never tried before thanks to Tourism Richmond. As a whole, I was impressed and am looking forward returning for a typical meal (so I can do individual writeups).